Step into a class section of PHYS 1602: Fundamentals of Physics II, and you’ll find a scene that’s far from the large introductory lectures common to the sciences on most college campuses. To begin with, the class of 30 students sits at several triangular stations, each with nine chairs centered around a workspace. On this day, the stations are covered with wires and electrical boxes that the students are using to demonstrate electromagnetic induction. At the start of the class, the instructors provide a short lecture, before the students set off on their own problem-solving tutorials. The instructors move from group to group, stopping to answer questions and check on the groups’ progress, as students shuttle back and forth to the white boards that line the walls. 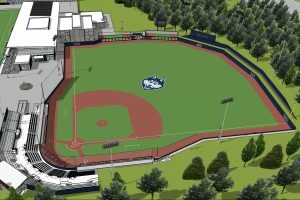 The curricular redesign, says Wells, will replace the typical large-lecture format with smaller classes, utilizing five new studio-style physics learning laboratories to be added to the Gant Science Complex this year. These changes will promote active learning, collaborative problem solving, and faculty-student interaction, he says. Traditional science courses, including those in physics, typically consist of three weekly lectures that hold 100 to 200 students, with once-per-week lab sections where students practice the concepts they learn in the lecture. But this setup poses challenges for professors and teaching assistants to cover the material at the same rate, often causing lecture and lab sections to fall out of synchrony, says Diego Valente, assistant professor-in-residence of physics and instructor for Fundamentals of Physics II. 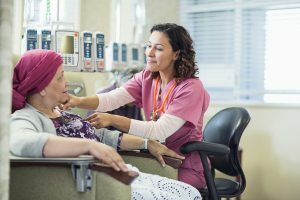 In addition, many physics concepts are difficult to teach within the logistical setup of a lecture, and the instructors may have a difficult time knowing whether students comprehend the material, Valente says. 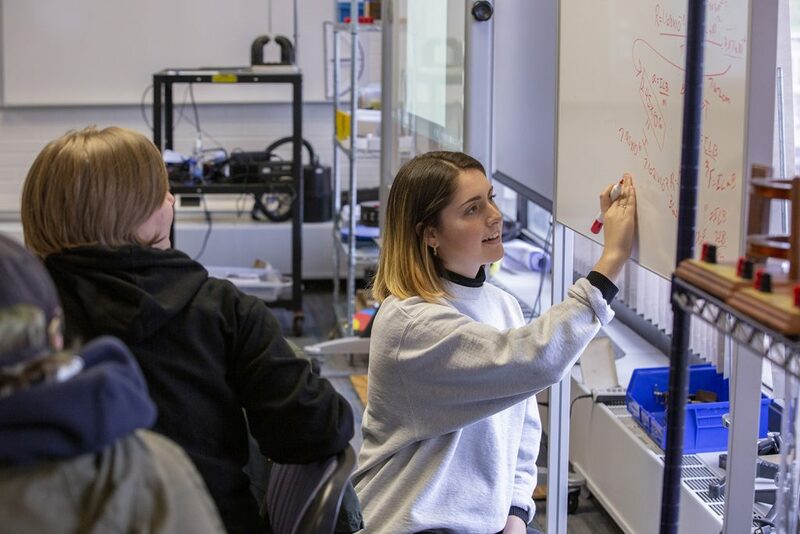 To combat these issues, the physics department piloted redesigned versions of Fundamentals of Physics I and II, the introductory sequence for physics majors, in the spring and fall of 2018, respectively. 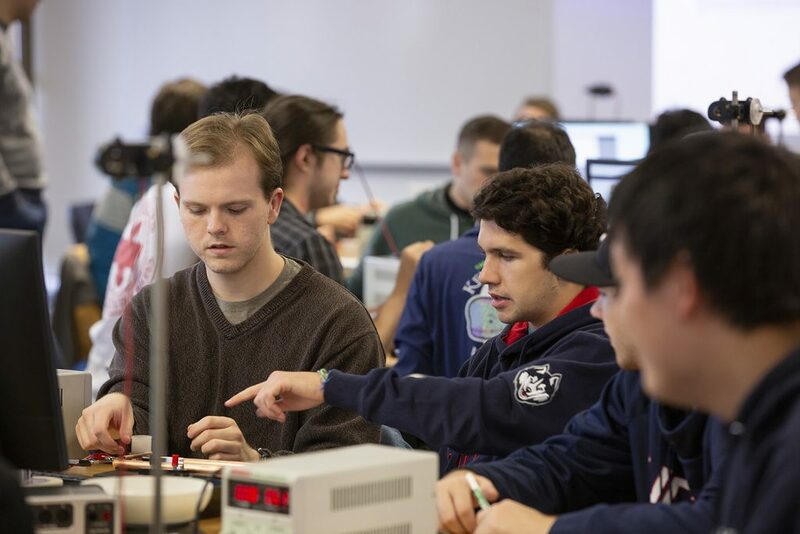 The new courses, which use the physics learning laboratories, merge the lecture and lab sections into three 2-hour class periods per week that hold up to 54 students. Classes are led by the same professor and graduate students. Ian Segal-Gould ’21 (CLAS), a physics and mathematics major enrolled in Fundamentals of Physics II, says the class fosters the collaborative problem-solving that is expected of professional physicists. 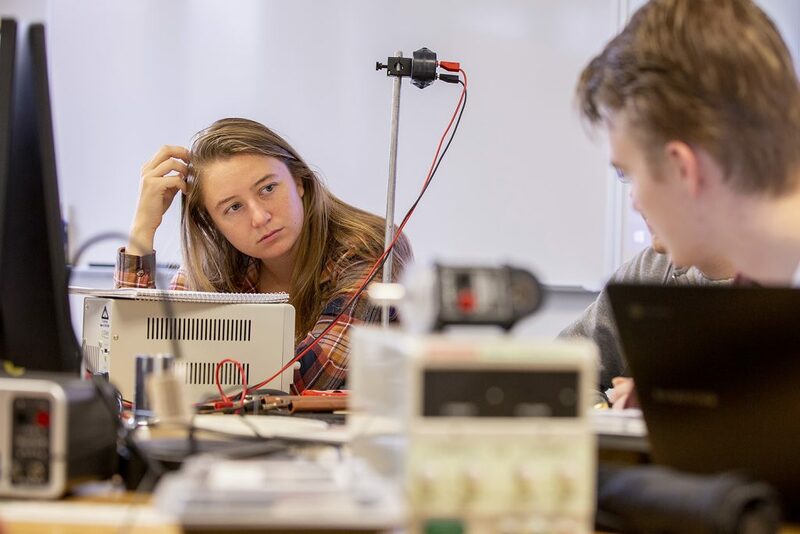 Fellow physics major Megan Sturm ’21 (CLAS) says that working in small groups helps the class build camaraderie and exposes her to new ideas. 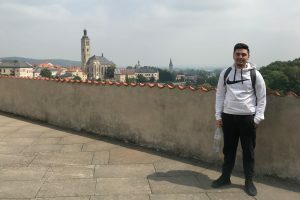 Kuna, who has taught for three years in the Department, says the faculty-student interaction helps him better gauge how students are learning the material so he can adjust his approach if need be. With a target completion date for phase one renovations set for fall of 2019, the department is gearing up to expand the redesign to other courses, including Physics for Engineers and Physics with Calculus, a general education sequence taken by many pre-med students. 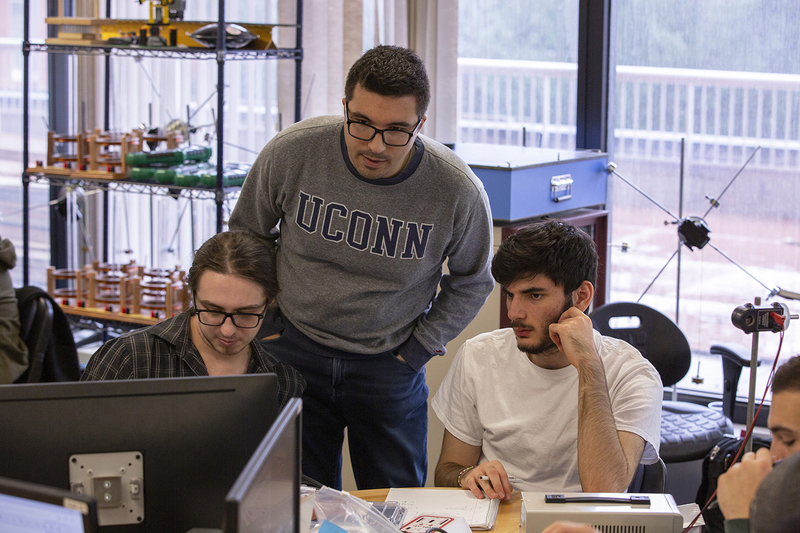 “Our goal is to develop not just comprehension of physical concepts, but also transferable skills – things like communication through group work and computer programming, which students can use in their professional lives,” adds Valente. 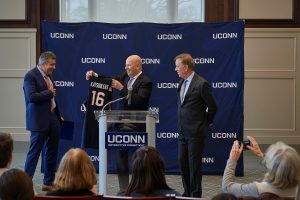 He says these investments in teaching and infrastructure give UConn an advantage in addressing instructional issues common at institutions across the United States.